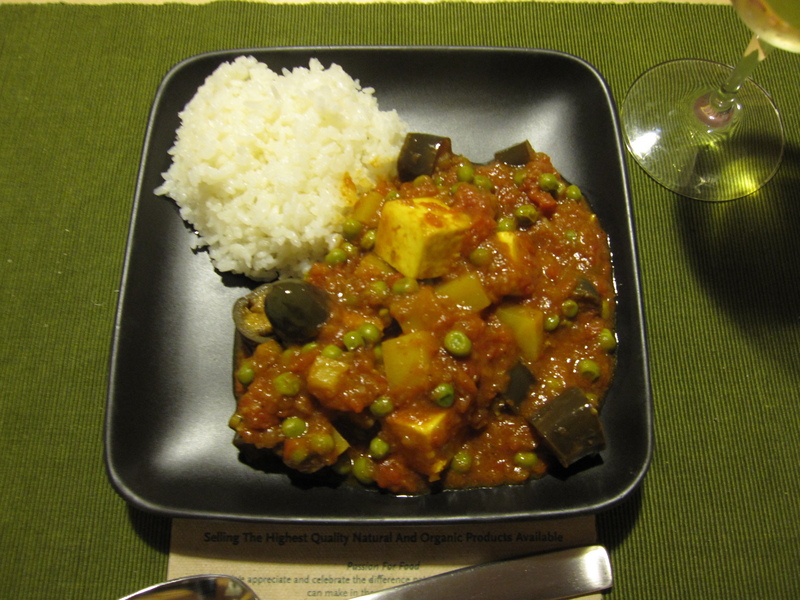 I made a vegetarian curry for Meatless Monday last night. For the protein I used paneer, but since it’s expensive ($8.99 for 8oz!) I decided to add a bunch of this really nice Japanese Eggplant they had at the store (only $2.99 a pound). I know eggplant isn’t protein, but it helped add substance to the dish while cutting the cost. I started by melting 3 tablespoons of ghee in a medium-high pan. I added a teaspoon of ground cumin and let it cook for a minute. Then I added an inch of grated ginger and 4 minced garlic cloves. Once those became fragrant but not burned I added a small onion that I had roughly chopped and then put in a processor to finely mince it to the point just before it became liquidy. I let the onion cook for about 6 or 7 minutes before stirring in 2 teaspoons of freshly ground coriander seed. Then I added a large russet that I had peeled and small diced. That went for about five minutes before I added one 28oz can of diced tomatoes. To that I added 1 teaspoon of turmeric and 1 teaspoon of garam masala. Once that all got to a slight boil I threw in five 5-6 inch Japanese Eggplants that were cut into chunks. Then I turned the heat down to medium-low, covered it, and let it stew for about 15 minutes. 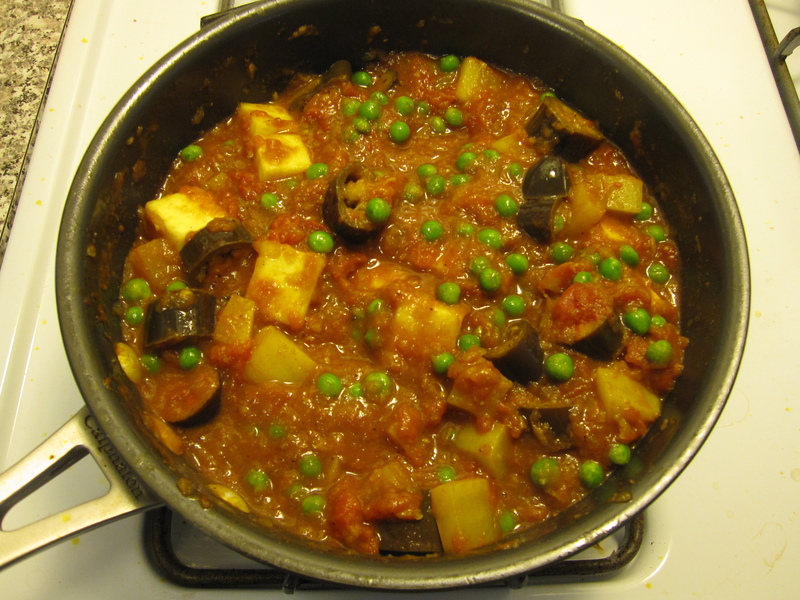 Once the eggplant and potato were cooked through I added the block of paneer that I had cut into smaller chunks, about 3/4 inch cubes, and 3/4’s cup of peas. I just needed to the paneer and peas to heat through, so I let them sit in the simmering stew for about 8 minutes uncovered which also allowed it to thicken up a bit. I wish I had some naan, but I did make some white rice to serve with it.